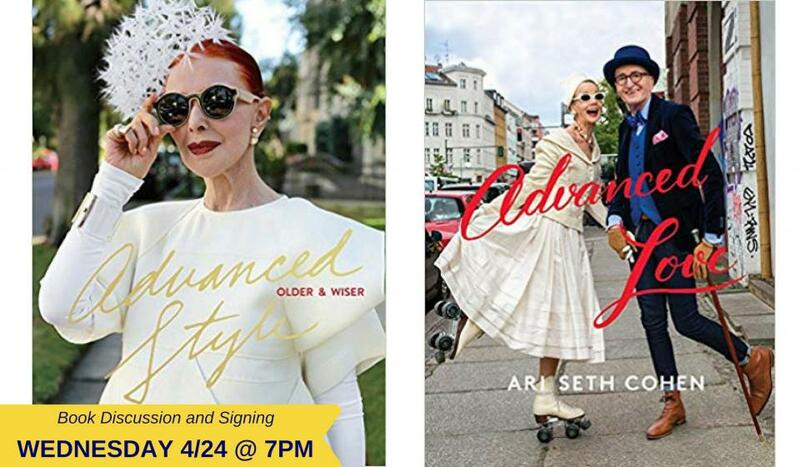 Ari Seth Cohen comes to Interabang to discuss and sign his series of fashion photobooks: Advanced Love, Advanced Style, and Advanced Style: Older and Wiser. These books’ images and words of wisdom provide fashion inspiration for all ages. They showcase wardrobes, interviews, adventures, and advice from a cadre of Ari’s chic and lively subjects – in luscious color, and largely in photos never before published. The books are beautiful extensions of Ari Seth Cohen’s style blog, but a term like blog cannot capture or even begin to describe Advanced Style, which is a collection of street fashion unlike any other. Advanced Style is blog-based ode to a kind of confidence, beauty, and fashion that can only be achieved through experience – the experiences of lives lived glamorously, and in the world’s most stylish locales. Ari Seth Cohen was inspired by his grandmother’s unique personal style and his own lifelong interest in the put-together fashion of vibrant seniors. The subjects of Advanced Style are enjoying their later years with grace and panache, marching to the beat of their own drummers. Each sparkles like a diamond after years of refining and perfecting her or his individual look and, indeed, approach to life. Joining Ari at Interabang is Valerie von Sobel, the internationally celebrated fashion icon. Valerie will sign copies of AMERICAN ORIGINALS: Creative Interiors to benefit her organization #compassioncantwait as well as copies of Ari’s Advanced Style books. Thanks to Samuel Lynne Galleries, Will Kolb, and Educares for sharing style maven Ari Seth Cohen with us on his Dallas visit.